Heavy duty marine thick wall prop shaft log hose. 1" inside diameter. Will fit our 1" cav rod seals. 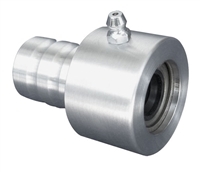 Also check out our 1" Stainless T-Bolt Clamps. 100% stainless steel construction. 1/4"-20 bolt with nylock nut. 3/4" wide. Will fit our 1" cav rod seal hose. Also check out our 1" cav rod rubber hose. 100% stainless steel construction. 1/4"-20 bolt with nylock nut. 3/4" wide. Will fit our 1 1/4" cav rod seal hose. Also check out our 1 1/4" cav rod rubber hose. with a 1/4" thread that meets in the middle for zero chance of shearing. Cav Rod Seal Rebuild Kit. 1x o-ring and 2x double lip grease cup seals. to match your existing hardware. Fits standard 5/16” wide standoffs and pads. website. Hide-A-Nut design to cover up the turnbuckle threads in any position. The 7 3/8” size fits a range from 6 7/8” to 7 7/8”. The 8” size fits a range from 7 ½”” to 8 ½””. The 8” size fits a range from 8 1/4”” to 9 1/4””. New design Cavitation Rod Seal (to match my bearing prop shaft log seals). The 1 size refers to the inside diameter of the rubber hose that is attached to you thru hull fitting. 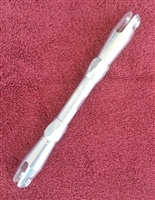 They are made to fit 1/2" diameter cavitation rods. Made from 6061-T6 Aluminum. They have 2 double lip cup seals with a gap in between them for grease. A snap ring on the front for containment and safety. Also at the water side is an o-ring for a total of 3 water seals. Also, while replacing your Cav Rod Seal, please check out our 1" Marine Grade Rubber Hose and 100% Stainless Steel T-Bolt Clamps.